Ancient Greece was an ancient civilization spanning over fourteen centuries, starting in the Archaic Era in the 8th century BC to the end of antiquity around 600 AD. This period was later followed by the Early Middle Ages and the Byzantine Era. After the fall of the Mycenaean civilization around 1100 BC, Greece entered the Dark Ages, and any advances in literacy and writing were lost. Three centuries later, in the 8th century BC, Greece started emerging from the Dark Ages, adopting and later modifying the Phoenician alphabet, thus creating the Greek alphabet. Greece was divided in small communities, following the geographical pattern of the region. These small communities were self – sufficient and were called city – states. After the rise of a mercantile class in the 7th century BC, considerable tension was created among those city – states, regularly resulting in conflict and war. The social classes also created tension, particularly due to increasing population and shortage of land. Spartans attacked Messenia and enslaved it, the citizens of Messenia becoming helots, working the fields for Sparta. Meanwhile, all Spartan males became soldiers in a permanently militarized state. 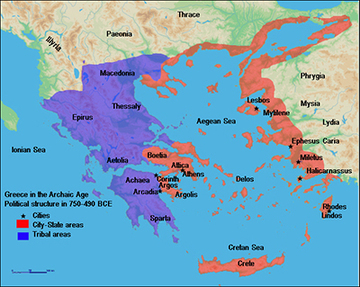 On the other hand, Athens dealt with an internal strife in the late 7th century, also because of lack of food and land. The archon Draco introduced a series of laws to quench the conflict in vain. A few years later, though, Solon managed to improve the living conditions of the poor, but at the same time established the roots of aristocracy in power. During the 6th century, four main powers had emerged in Greece; Athens, Sparta, Corinth and Thebes, uniting the respective nearby lands into one. The increasing population resulted in the colonization of Southern Italy and Sicily (also called Magna Graecia), Asia Minor and elsewhere. Towards the end of the 6th century, Athens fell under tyranny, while it also eventually had armed conflicts with Sparta. After a turbulent period, the tyranny was overthrown and democracy was born. This new type of government resulted in Athens entering a period of cultural and social renaissance, also known as the Golden Age. The conflicts between Sparta and Athens had to stop, as they both faced a common danger, the Persians. Under the leadership of Darius I, the Persians invaded Greece multiple times, failing to subjugate the region. However, Sparta tried to seize the opportunity and managed to weaken Athens, which was forced to sue for peace. The 4th century found Athens under a Spartan hegemony. However, the Spartan troops were far too weak and spread out, so this led to a series of conflicts, power changing hands very often. This ended with the rise of Macedon, led by Phillop II, who unified the region under his rule. His son, Alexander the Great, managed to decimate the troops of Darius III and create a glorious Greek Empire that spread all the way to India. The Hellenistic period started in 323 BC, the year Alexander died, and lasted until 146 BC when Greece was annexed to the Roman Empire. The Roman rule did not break the continuity of Hellenistic society and culture, which was only defeated by the rise of Christianity. However, it marked the end of its independence.